Garett Bolles exited practice early Monday morning on a cart after being hit in the chin during practice. Bolles was evaluated for a concussion but cleared concussion testing and was able to participate in practice Tuesday. The 2017 PFWA All-Rookie Team member is a cornerstone player for the Broncos’ offensive line and having Bolles miss any time in 2018 would be a major blow to their offense. 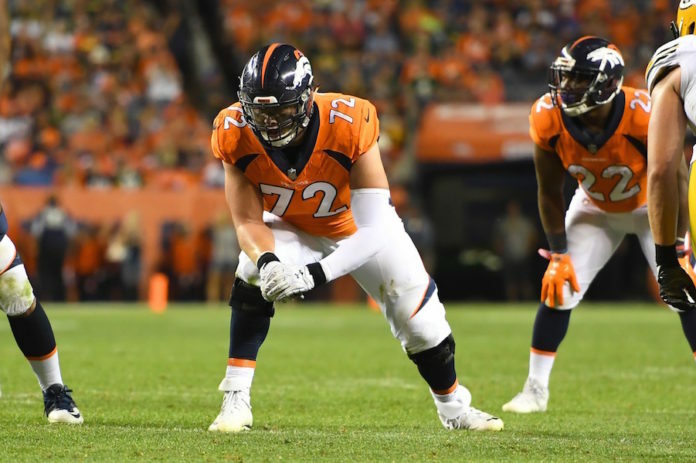 Speaking to Eric Goodman & Les Shapiro of Mile High Sports AM 1340 | FM 104.7, Garett Bolles talked about his injury scare, and what he has learned from his rookie year going into year two. Bolles describes what was going through his mind when he was hit and the process that he went through to get back onto the field. There were 281 reported concussions during the 2017 NFL season, and the concussion protocol is something that Bolles is happy that exists. Bolles is excited about the veterans that are on the offensive line with him and is looking forward to working with them again in 2018. “Knowing that I have Ron Leary next to me and Matt Paradis and I’m grateful for them,” said Bolles. Click here to listen to the full interview with Garett Bolles.